With the world turning to online solutions for a variety of needs in greater numbers every year, it is important to keep track of the all-important changes in how Google adjusts its algorithms to reflect market changes. Small tweaks with Google policies can have a large ripple effect on business owners and their web assets. Keeping track of these changes can help you adjust strategies and techniques to minimise the fear of the unknown and remove the guess work. 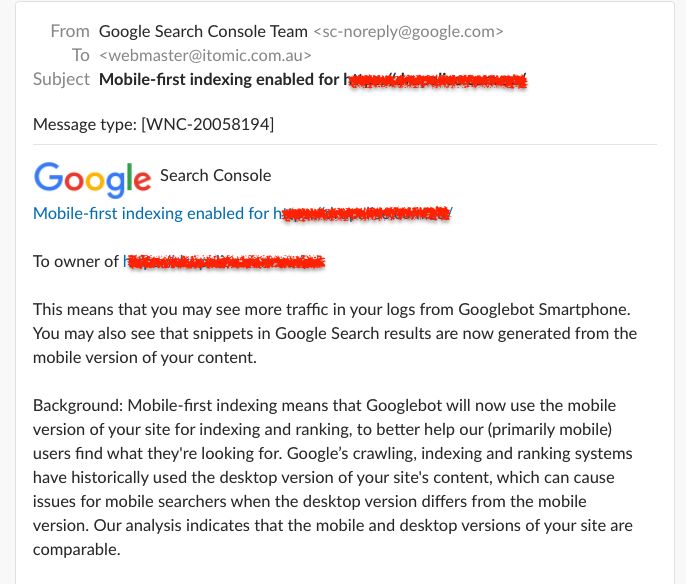 According to Google, the latest mobile first indexing update was rolled out due to majority of their users now accessing their search engine through mobile devices instead of desktop machines. The concept of mobile first indexing is fairly self-explanatory. It means that a business, organisation, or individual’s mobile site becomes the first option for what Google includes in their search engine results pages (SERPs). Mobile first indexing, however, will not entirely eliminate references to sites that don’t have a mobile friendly page. Google will still continue to show the URL that best suits the search, whether that URL is for a responsive or a traditional desktop-only site. However those sites with a non-responsive site or a poorly designed mobile site could miss out on preferred rankings. Embrace Responsive Web Design. This makes the traditional desktop site accessible to all desktops, tablet and mobile users as the screen serves up the same information to ‘fit/work’ on all screen sizes across all platforms. Don’t neglect performance. Make sure the mobile performance is satisfactory at all times (you can check by using free online tools). Generally speaking, at the time of writing, 3-5 seconds for initial page load time is acceptable before users start to lose patience and move away. Be mindful of development changes. Many development changes, particularly cosmetic, can seem favourable on a desktop site with large screen real estate. However they can often have a negative impact on the user experience/performance for the smaller screens. Keep an eye on analytics. Organisations will do well to keep a close eye on any traffic changes that may result after this update. Make sure your goals/events are still firing correctly and review them on a regular basis. It’s important to think of this update as a sign that Google is preferring mobile traffic, and not punishing the non-responsive/mobile traffic. As such, it’s a call to action to jump on the responsive/mobile band wagon to ensure maximum exposure via the every growing giant that is Google. Itomic is happy to assist with end to end delivery of best practices for anyone needing assistance – just shout if you need any help!